If Hudson really wants to impress with their Virtual Console releases, they should localize this quirky, long-lost gem for English-speaking audiences. 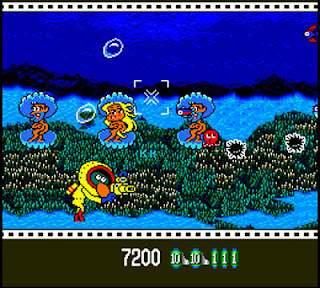 Although NEC's PC Engine was home to many oddly endearing games during its wildly successful run (it gave Nintendo's Famicom a run for its money back in the day--a feat it unfortunately couldn't replicate in the U.S. with the TurboGrafx-16), few if any were wackier than Photograph Boy (also known as Gekisha Boy). Players control a green-around-the-gills photographer who hits the streets looking for the perfect shots to take back to his gruff-looking newspaper editor. If that sounds like a piece of cake, wait until you give it a go. As the lushly detailed environments scroll by, photographic opportunities--such as hovering UFOs, burning buildings, even flashers in trench coats--pop into view, ready for their close-up. Using up a few rolls of film would be a snap (pun intended) if it weren't for all the dangers surrounding our intrepid photographer--balls, skateboards and other random projectiles pose a constant threat. Get hit and you lose valuable film--an important distinction because the more well-taken photos you turn in, the more points you receive from your boss and the more likely you are to advance to the next level. Controls in Photograph Boy are about as tight as they can be--movement of your character and aiming your camera is handled with the d-pad, while the action buttons control your camera's shutter and your ability to jump. Unfortunately, the well-tuned controls don't make the game a walk in the park--it's more like a walk down a darkened alley in the bad part of town. Expect to repeat each level many times before you succeed--especially as the game progresses. Considering the sights you'll see along the way, you'll likely enjoy every hair-pulling minute of it. At least I did.